There is so much bad news coming out of Gaza that no one seems to notice that there is a a severe water crisis. According to the authorities in Gaza, about 95 percent of the municipal water is undrinkable by international standards, and in any case, some 60 percent of homes don’t have access to potable water on a regular basis. Private water tankers make the rounds of Gaza City neighborhoods, and residents buy what they need to drink, cook and clean. It is a health disaster. 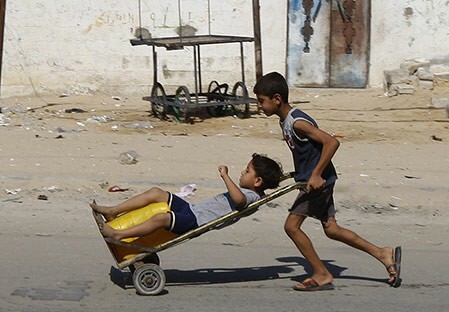 Palestinian boys making a water run from a UN relief facility in Gaza. The relentless economic blockade being carried out by Israel has virtually choked off infrastructure maintenance. Electricity, for example, is in short supply. Water and electricity go together. It takes electricity to produce and transport water, and it takes water to make electricity. In Gaza, the water shortage creates an electrical shortage which creates a water shortage. Because of electrical shortage, sewage systems, desalination plants and water pumping stations are barely working and there seems to be no hope for improvement. Since Gaza’s once healthy aquifer is being depleted faster than it can be replenished, sea water intrusion is causing saline and nitrate contamination that make the water unsafe to drink. 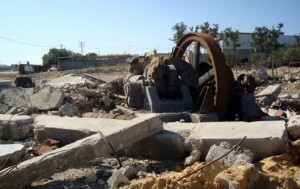 One of many Gaza water wells destroyed by Israeli military.